Philip Seymour Hoffman and Ethan Hawke in Sidney Lumet’s Before the Devil Knows You’re Dead (2007). Sidney Lumet, the American filmmaker with one of the more impressive streaks of movie-making longevity, has passed away at the age of 86. Lumet began his storied career during the era of live television in the 1950s, quickly graduated to directing feature films, and rarely looked back while helming a handful of the most memorable films of all time. Perhaps more impressively, he is one of the few of his generation who understood the importance of both the artistic prerogatives that filmmaking requires, as well as appreciating that there are actual living, breathing people sitting in darkened movie houses, wanting to be entertained. Many filmmakers understand this duality; extremely few succeed at both. Lumet was one who, more often than not, did. Lumet was also extremely effective at communicating how films are made, the joy of working in the business, and the importance of film as art. His book Making Movies is not only a great read full of interesting anecdotes from his career and collaborations, but a tremendous guide for the beginning filmmaker. In honour of a great career, here are ten great Sidney Lumet films. 10. The Verdict (1983) – Lumet directs Paul Newman and Charlotte Rampling in the story of a lawyer trying to recover his tarnished reputation and career with a high profile case. 9. Before the Devil Knows Your Dead (2007) – Lumet’s last film perfectly illuminates his ability to balance artistry with commercial fare. 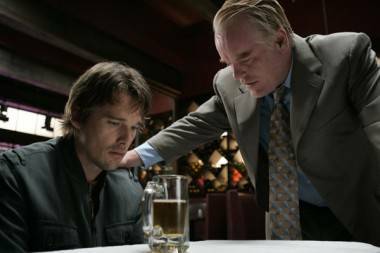 Philip Seymour Hoffman and Ethan Hawke play brothers desperate for money who plan the heist of their parents’ jewelry store. 8. The Group (1966) – A lesser known Lumet film, The Group follows a group of women who graduate from an elite private girls school as they find love and understand life. 7. Murder on the Orient Express (1974) – Perhaps the best Hercule Poirot film made, Lumet attracted an all-star cast for his film adaptation of Agatha Christie’s most famous novel. 6. Running on Empty (1988) – River Phoenix stars as a young man wanting experience life, even though this would endanger his fugitive parents. 5. Long Day’s Journey Into Night (1962) – A film adaptation of the Eugene O’Neill play about the trials he experienced at home as a boy. Katharine Hepburn stars as the drug-riddled matriarch conducting the dysfunction through her mania. 4. 12 Angry Men (1957) – Also based on a play, 12 Angry Men is considered not only one of the greatest films of all-time, but of having perhaps the greatest ensemble performance as well. Henry Fonda leads the cast as the lone holdout on a jury desperate to convict an innocent man. 3. Serpico (1973) – The true story of a New York City police officer (played by Al Pacino) who informed on his co-workers rather than sell out his principles. 2. Network (1976) – Peter Finch won an Oscar for playing a TV anchor that mentally unravels and begins prognosticating, cryptically yet accurately, about the role of the media, and finds himself further exploited by the executives he derides. 1. Dog Day Afternoon (1975) – Pacino (again) and John Cazale are stellar in this retelling of the remarkable true story of a couple of down-on-their-luck bank robbers whose heist goes from bad to much, much worse. This entry was posted in Movies and TV and tagged directors, Movies and TV, Philip Seymour Hoffman, Sidney Lumet. Bookmark the permalink.